At the end of Evil Dead II the hero, Ash, was pulled into some kind of time portal along with the monster he was trying to banish. He ends up back in the 14th century, surrounded by men of King Arthur (obviously not the King Arthur, since that guy- if he existed- lived and died centuries before this), who mistake him for a soldier of their sworn enemy, Henry the Red. Ash and Henry's men are chained up and sent to their deaths in a pit where Arthur keeps some zombies, but since Ash has developed godlike battle skills thanks to his hour of training he got back in the cabin in the previous movie he is able to pretty easily destroy the zombies and escape. People begin to trust him and he is told that there is a formula in the Necronomicon, the book of the dead, that can send him home. Not really concerned with anything other than going home, Ash heads off to retrieve the book! 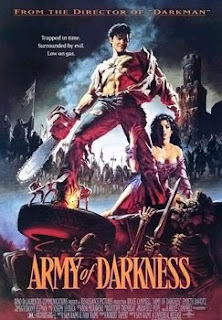 Army of Darkness is a very entertaining movie. It's funny and ridiculous and has some very charming old-fashioned special effects, like adorable stop motion skeleton warriors and trick photography. But what kind of movie is it exactly? It is the third Evil Dead movie, but shares little in common with either of the previous films. If anything, it feels a lot like an adventure or sword & sorcery movie. And not a particularly brutal one at that. It's certainly not scary. In fact, cut some scenes a little short and you could show this movie to children, who would definitely find the skeletons cool rather than creepy. Stylistically, you won't see any of the amazing camerawork from the first movie in this one. Honestly, the movie looks a little cheap overall, which is surprising considering the budget this movie had compared with Evil Dead. Between the lack of violence/gores/scares and the somewhat cheap look, watching this movie often feels like watching a really good made-for-TV feature, which is a huge letdown considering how epic Evil Dead II felt. Bruce Campbell's Ash is an interesting character, but as a character he is turned up to 11 this time around, and although most of the time he's hilarious, sometimes you feel like they were trying way too hard to make him into this kind of sarcastic superhero. I think the best version of this character was definitely from Evil Dead II, where he was played more subtly. 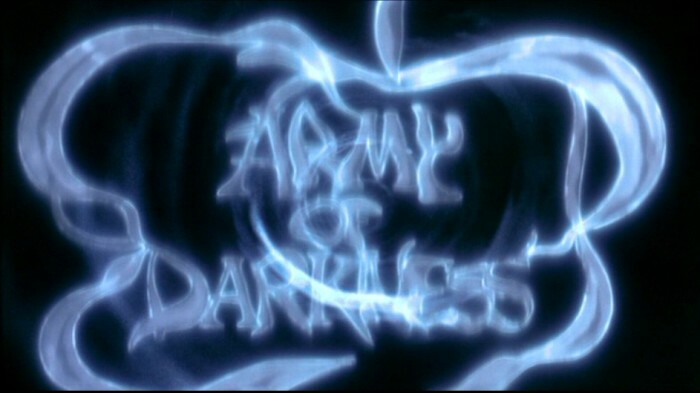 The subtle humor mixed with the gross-out gore scenes hit the mark exactly and worked so well, so it's a bit of a shame that they had to go so over the top with Army of Darkness. Make no mistake, it is a worthy sequel. It's just quite a step down from two excellent films and I couldn't help but feel let down by it. Some of the jokes fall flat and without the edge provided by the suspense and absolute terror from the first film, or the gross out gore gags from the second, I was left kind of feeling a little awkward about the whole movie. "Let's get out of here!!!" The skeletons were all awesome in this, especially that one. I also really liked the one crawling towards Ash with a dagger clutched in his teeth muttering "I'm gonna cut out yer gizzard"